Over at an XFastest Network event in Taipei, ASRock showed off a roadmap of its video card portfolio. One of the interesting conclusions seems to be, that at least at this moment, ASRock isn't planning any new video cards until at least February 2019. A second-generation of Radeon RX (MK2) cards are planned to be released next month, but after that there's nothing new on the roadmap. These new MK2 models will be sold alongside the current Radeon RX500 cards. Additionally, the roadmap also suggests there will be no custom-design Vega cards from ASRock. 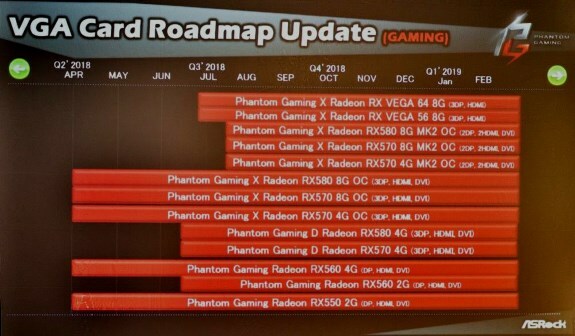 The most interesting tidbit from this roadmap is lack of any future Radeon series till at least February/March. One would guess this is when new series (600) could appear or when Radeon 500 series will no longer matter.